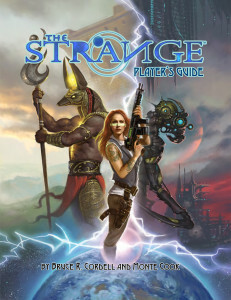 The Strange launched in August 2014 with the release of the corebook and Player’s Guide, along with some additional supporting products. 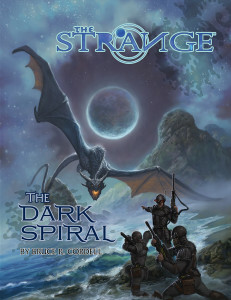 The Strange corebook contains everything you need to play in a beautiful, premium-format, 416-page hardcover that includes a double-sided poster map. Don’t forget to also pick up a copy of the Player’s Guide for a second set of those most critical rules. Create characters, explore the setting, and learn how to play—or just have a handy second set of rules at the gaming table—with this inexpensive player’s alternative to the The Strange corebook. It’s 96 pages of the basics, including six pre-generated characters, for an incredible price. 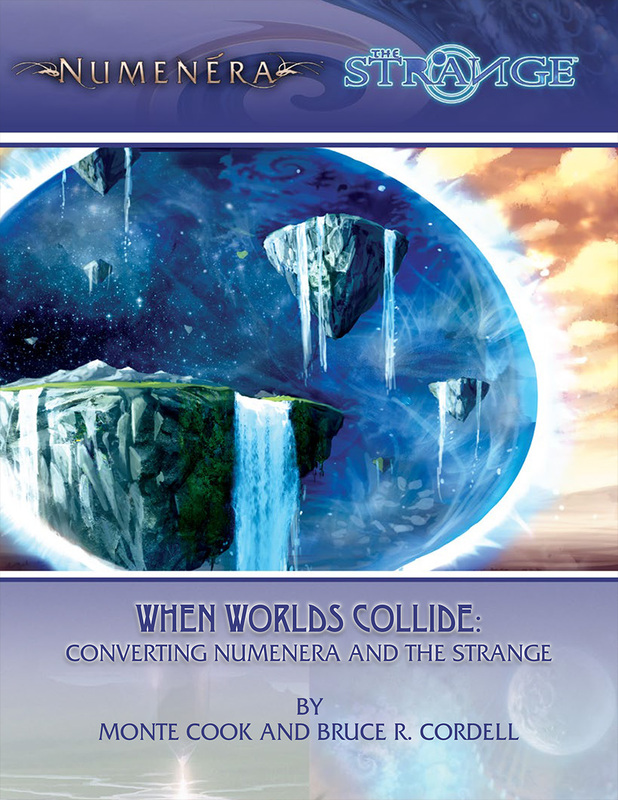 The incredible flexibility of the Cypher System makes it possible—easy, actually—to convert characters, creatures, cyphers, and other elements of Numenera for use in The Strange—and vice-versa. This handy guide gives you all the information and tips you need to literally double the resources available for your Numenera or The Strange campaign. 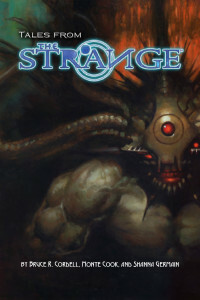 An anthology of two short stories set within the universe of The Strange. In “The Stranger” a monster out of a recursion called Ardeyn discovers that Earth isn’t the prey-laden hunting ground it expected. In “Four Winds,” a doctoral candidate on sabbatical discovers a dangerous new dimension to her Native American heritage. 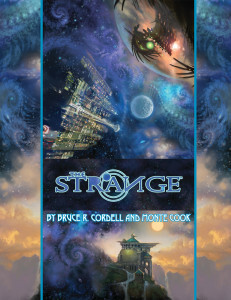 More fiction from The Strange creators Bruce R. Cordell and Monte Cook, along with MCG’s managing editor and award-winning writer Shanna Germain. 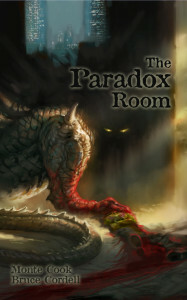 Four stories that take readers to worlds unknown—from the hidden underbelly of Earth, to the dangerous landscapes of Ardeyn and Ruk, and beyond—where every choice is fraught with pleasure or peril and every action is laced with the possibility of discovery or destruction. Spiral Dust is the latest threat on the street. Following the winding path from junkie to dealer to distributor propels characters off Earth to recursions both known and wholly new. While Ardeyn and Ruk offer dangers stiff enough to faze even veteran players, PCs eventually must face the Dustman, a “malign sandman” whose true nature is almost too alien for human minds to comprehend. Several linked adventures in a hefty package! Exploration and risk are everything in The Strange. Players earn experience points not for killing monsters, but for making discoveries and facing unexpected challenges. 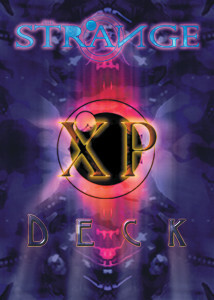 And XPs are a sort of currency, often changing hands between players.The Strange XP Deck gives you a set of tangible tokens to represent experience points—a simple but useful tool at the gametable. 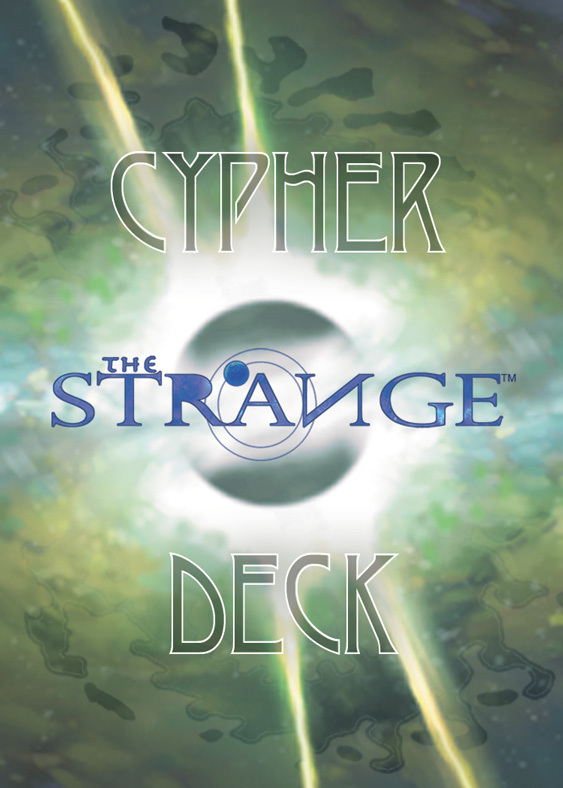 Cyphers are minor devices that “break the rules” of the realm into which they are carried, creating powerful but usually single-use effects. They come and go frequently, in a The Strange campaign. This deck of 120 full-color cards allows GMs and players to skip the tables and die-rolls and quickly generate random cyphers on the fly.